Inheriting beautiful Eden Hall brings Araminta ‘Minty’ Cardale a host of problems. 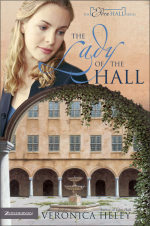 With quiet determination she embraces her new role as Lady of the Hall, working hard to keep the struggling Hall open to the public, and to continue the charitable foundation her father established. But her resentful stepfamily fight her at every turn, and some of the staff at the Hall are up to no good. As the hostility mounts, Minty seeks refuge in the love of her childhood sweetheart, Patrick, only to discover that even his support is threatened by her conniving stepfamily. Will Minty’s family – and the burden of so many unforgiven hurts – destroy her and any chance she has for love and happiness?